You’re a gearhead. You know to chuckle knowingly and condescendingly when some dumbass refers to the “V4" in their Honda Civic. You know your stuff. You know what a flat engine is, too. It’s an opposed-piston engine, right? Sometimes they’re called boxer engines, like what Porsche and Subaru use. Same thing, right? Well, not exactly. Let’s clear up this often-confused bit of technical arcana. I’ll admit, I was pretty cloudy on this concept myself. I realized this when I was doing research on the Steyr 50, a small Austrian car that used a front-mounted flat-four engine. That bold part, where the engine is described not as a flat-four, but as a 178° V4 is what made me laugh. How insanely pedantic would you have to be to not just call it a flat-four or a boxer engine, and instead call it a V engine because of two tiny degrees? This led me down a path of research where I realized that, yes, while calling a flat motor a 180° V motor is goofy and pedantic, it’s actually not really wrong, especially when you realize that there is actually a real, definite difference between a V-engine where the V is so flat it’s a straight line, and a true boxer flat engine. From the outside, the engines look pretty much the same; a boxer and a 180°-V/flat engine will both have two banks of cylinders coming off a central crank, and the whole bottom end of the engine will be, well, pretty flat. So, here’s the big difference: the parts on the crankshaft that the connecting rod of the pistons connect to is called a crankpin or crank journal. In a flat engine that is not a boxer, pairs of pistons share a crankpin. In a true boxer engine, every piston has its own crankpin. It’s actually cheaper to produce crankpins that only accomodate one cylinder, which may offset the costs of having more individual crankpins. The result of the boxer motor’s use of individual crankpins is that the pistons on either side move opposite one another, which helps to cancel out engine vibration. The back-and forth motion of the pistons resembles the punches of a boxer, which is where the engine gets its name. 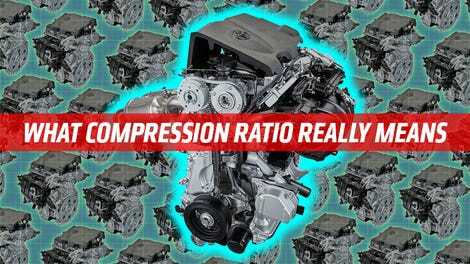 Subaru engines, old VW air-cooled engines, Citroën flat-fours, most Porsche flat engines (the flat-12 in the 917, incredibly, was not a boxer), Panhards twins, the Corvair’s flat-six, Lancia’s flat-fours, all of these were true boxer engines. Flat engines that are not boxers are more rare, though they do exist. Generally, they have the packaging advantages of a flat engine, but don’t have the inherent balance of a boxer engine. If I’m absolutely honest, I’m really not sure why you would want a flat engine that wasn’t a boxer, though I can speculate on some reasons: maybe you were adapting another V-type engine, and you wanted to retain the crankshaft? Okay, I can speculate on one reason. Yes, my friends, it’s true. 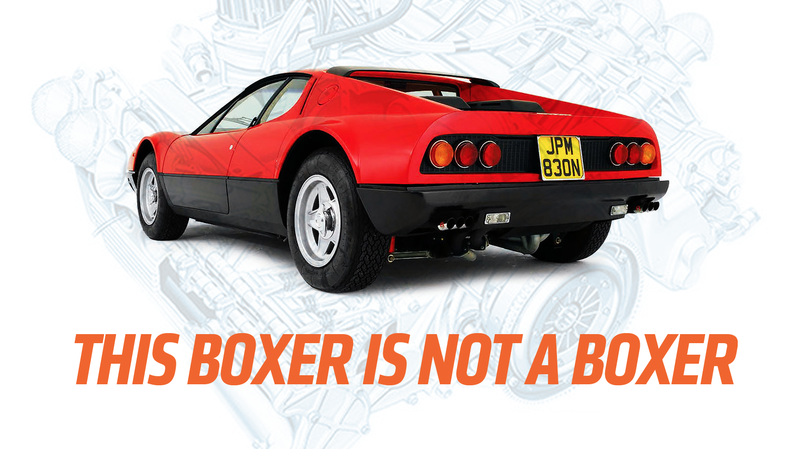 The Ferrari 512 Berlinetta Boxer with the flat-12 engine is not a car with a boxer engine. The irony is so, so rich and creamy here. This car is one of the only cars to actually be named “Boxer” (even Porsche stuck an “s” and a “t” in the middle of the word when they named their car) and while it does have a horizontally-opposed engine, it’s not a boxer engine. It’s a bit tricky to see, but if you look at the highlighted part there you can see that the piston rods are definitely sharing crankpins. Again, the Boxer has no boxer. So, now you have a whole new exciting thing to be automotively pedantic about! To you, you’re welcome, and to your friends, my sincerest apologies.